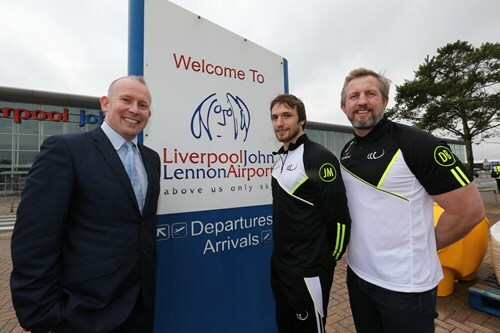 LIVERPOOL, UK, 2018-Mar-20 — /Travel PR News/ — Widnes Vikings are proud to have formed a major new commercial partnership with Liverpool John Lennon Airport. Liverpool John Lennon Airport currently handles almost 5 million passengers per year with flights to over 60 destinations in the UK and across Europe. It is the Faster, Easier, Friendlier Airport of choice for passengers from across the region and is recognised for its relaxed, hassle free environment and best in class operational performance. The new partnership sees the airport secure significant branding opportunities across the Vikings stadium, print and digital channels. This includes featuring on the home and away dugouts, as well as prime TV advertising positions within the stadium. Liverpool John Lennon Airport will also have an unmissable branding presence in Denis Betts’ press conferences and player video interviews. The partnership was formally launched with a visit to the Airport by Denis Betts and Vikings Co-Captain, Joe Mellor. The pair enjoyed the opportunity to meet with senior Airport Management and hear all about the Airport’s latest developments. This entry was posted in Airports, Sports, Travel, Travel Management, Travel Marketing, Travel Services, Travelers and tagged commercial partnership, Denis Betts, Joe Mellor, Liverpool John Lennon Airport, Paul Winfield, Richard Munson, Vikings stadium, Widnes Vikings. Bookmark the permalink.